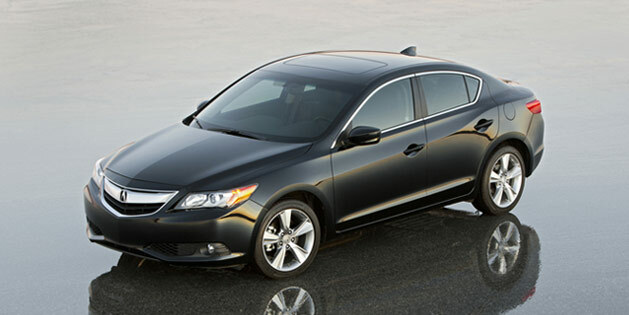 The Acura ILX luxury sports sedan has earned the 2014 IntelliChoice Best Overall Value of the Year Award in the Premium Compact Passenger Car category. The IntelliChoice award is based on analysis of every new model sold in the United States and identifies those that have low total ownership costs and lower than expected costs over time when compared to similar models. With its high quality and well-appointed interior, ILX is smart, spacious and sporty. It offers numerous features important to luxury buyers, including a Keyless Access System with smart entry and push-button start, Pandora® interface and SMS text message function for easy connectivity, Bluetooth® HandsFreeLink®, and a power moonroof. Additional standard equipment on the 2014 Acura ILX includes 17-inch alloy wheels, leather seating surfaces, an eight-way power driver’s seat, heated front seats and a Multi-Angle Rearview Camera. The ride experience is further enhanced by an audio-system subwoofer and an Active Noise Cancellation (ANC) system. Also available on ILX is the AcuraLink™ Satellite Communication System, Acura Navigation System with Voice Recognition™, AcuraLink Real Time Weather™ with radar image maps and HomeLink. Throughout the year, IntelliChoice aggregates and analyzes data on nearly 2400 vehicle models to determine its Best Overall Values. Data gathered from auto manufacturers, the U.S. government and third-party resources are used to determine the actual costs of ownership for each new vehicle over a five-year period. IntelliChoice then assigns a value rating to each vehicle and compares that rating to peer models to determine a Best Overall Value in each vehicle class. The Best Overall Value awards help consumers understand that the total cost to own a vehicle is influenced by a variety of factors beyond initial purchase price.